You will want to use your main domain for the nameservers. For example, if your main domain is digitalpacific.com.au you would use ns1.digitalpacific.com.au and ns2.digitalpacific.com.au for the nameservers. Make sure to replace "yourdomain.com.au" with your domain name. Setting up your own private nameservers on a cPanel server has many benefits, most importantly enabling all of cPanel’s built in DNS tools which can make DNS changes much easier. This guide will show you how to set up and register new private nameservers on a cPanel server using the WHM (Web Host Manager) interface. Most users will want to use a domain name they already own, often the same domain name that is being used for the hostname of the server that will be running the private nameservers. For this example, we will use a fake domain called example.com. Our server is called host.example.com and we will be setting up ns1.example.com and ns2.example.com. 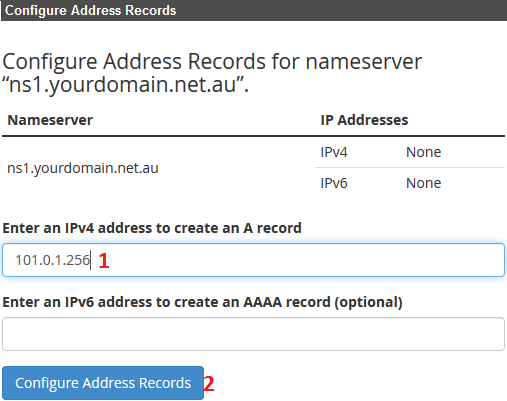 Now type in your IP and hit Configure Address Records. Note: You would have received an email with your available IP's. If unsure, submit a suport ticket and we can forward this information to you. NOTE: If you have 2 nameservers, it's fine for both of them to point to the same IP address. Step 3 - This step likely needs to be done by your registrar. To find your domain registrar, you can use websites like https://whois.auda.org.au/ and https://tppwholesale.com.au/provider/ (for .au domain names, use the TPP one if auda says the domain is with TPP), and https://who.is (for .com .net .org and other standard domain name). Step 1 - Login to your Digital Pacific Client Area. Step 2 - Select Domains from the top. 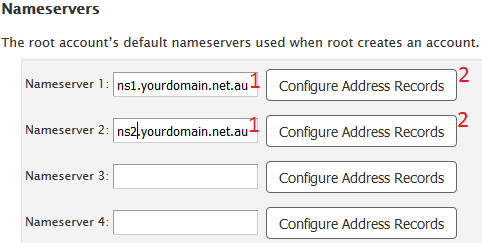 Step 3 - Select the tool icon for the domain you wish to set up whitelabel nameservers. Step 4 - Scroll down and select REGISTER NAMESERVERS. Contact your registrar, provide the nameservers you've set and IP's set for them, and ask them to set Host/Glue records. That's it! Once this is done it can take between 4hrs and 24hrs to fully propagate and for them to become live. 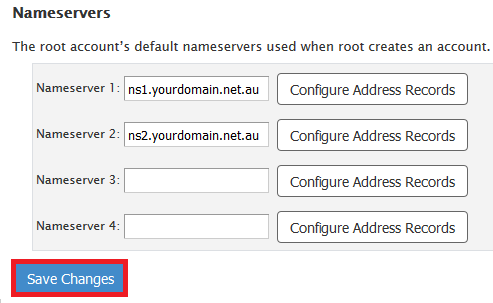 You can now start using those nameservers to connect domains to your server, and they should start working within 24hrs of the host/glue records being added.